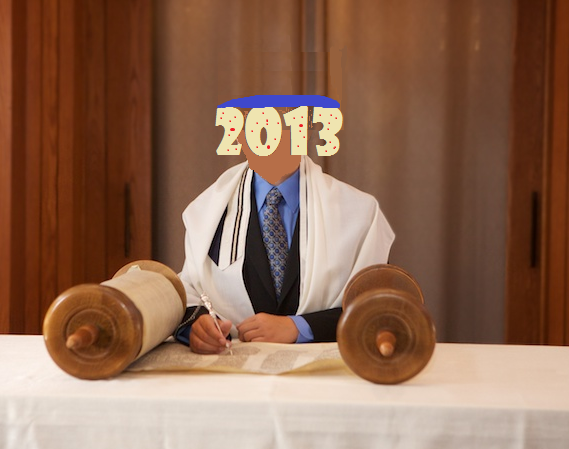 CHARLOTTE, NC - (@The Comedy News) - Shortly after turning 13-years-old on January 1st, the 21st Century was called to the Torah as a Bar Mitzvah on Saturday. Sporting a blue Yamaka, his father's Talit, and the most adorable case of teenage acne, 21st Century led a beautiful service and gave a heartfelt Bar Mitzvah torah portion sermon. "This was a huge thrill for me", said the 21st Century after the ceremony. "I always dreaded turning 13, ya know, because I have stage fright. And learning Hebrew was no cake walk either, especially having to go to Hebrew school two days a week with all of my rambunctious pals." The theme for the 21st Century's Bar Mitzvah was "Time Flies". The tables for the luncheon were themed with time travel-based films and books. 21st Century sat at the "Back to the Future" table, while his parents and grandparents sat at the HG Wells "The Time Machine" table. A rumor went around that the Bar Mitzvah boy's 'obligated invites table' (commonly known as the "reject table") was the "Groundhog Day" table. This came as a surprise since 21st Century's sister and her atheist fiance sat at the "Bill And Ted's Excellent Adventure" table. Apparently, the atheist fiance complained about the perils of organized religion the entire time, alienating everyone within shouting distance. 21st Century's obnoxious Aunt and Uncle were seen complaining about how the food was not served fast enough, and then spent the remainder of the luncheon estimating how much money the entire Bar Mitzvah likely cost 21st Century's family. Estimates were as low as $24.53 and as high as $34,000. *****Nobody slow danced except for 21st Century's older sister and her atheist fiance.